On the 11 September last I was privileged to deliver the annual Lucas Lecture to the Stephen’s Green Hibernian Club in Dublin. I was very grateful to the Club for the invitation, which provided me with an opportunity to share some of my research on the Irish who have received the Medal of Honor. The Guests of Honour at the event were United States Ambassador to Ireland H.E. Mr. Kevin O’Malley and Irish Minister for Foreign Affairs Mr. Charlie Flanagan T.D., while among the audience were Papal Nuncio Archbishop Charles John Brown and a number of senior officers of the Irish Defence Forces, among many others. As I thought the topic of the night’s talk might be of interest to readers, I have shared it below in full, together with the slides that accompanied the presentation. Mr. Ambassador, Minister, Archbishop, assembled guests. 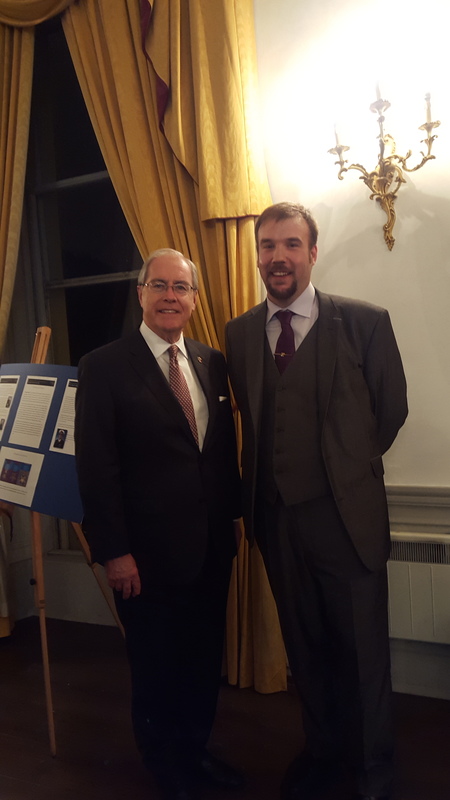 It was a great honour to be asked to deliver this talk to you tonight on Irish dimensions to the Medal of Honor, and to examine the military connections between Ireland and the United States. It is of course all the more poignant given that we are meeting to discuss this topic on the 14th anniversary of the terrible events of 11 September 2001. During the course of the talk I will look at a number of the Irish men and Irish families who are connected with the Medal of Honor, with reference to locations connected with several of tonight’s guests. As well as examining some of the different actions for which the Medal was earned, I also hope to look beyond, to explore the wider experience of some of the medal’s recipients. Our story begins on 13 February 1861, two months before Confederate shells at Fort Sumter, South Carolina, signalled the start of the American Civil War. That was the day United States Army Assistant Surgeon Bernard John Dowling Irwin set out on a rescue mission. He was a long way from the rapidly degenerating situation on the nation’s east coast, but he was even further away from his native Co. Roscommon. His situation seemed bleak. Bernard was setting off –into a snowstorm– with just 14 mule-mounted men under his command, and 100 miles to cover. Irwin had volunteered to undertake this effort, which hoped to reach a party of infantry surrounded in Apache Pass, Arizona, by the soon to be renowned Native American chief Cochise, of the Chiricahua Apache. The surrounded soldiers found themselves in their predicament due to the rash actions of their young Lieutenant, George Bascom, in treating with Cochise. What later became known as the ‘Bascom Affair’ would make a dangerous enemy of Cochise, and would ultimately lead to years of war. But that was in the future. For now, Irwin was focused on rescuing Bascom and his men. Across two days he drove on, marching an incredible 65 miles on the first day alone. On the second day they engaged and captured several Chiricahua, along with horses and cattle, before ultimately reaching Bascom and helping to break the siege. Bernard J.D. Irwin would go on to have an illustrious career; among other achievements, he is credited with establishing the first tent field hospital of the Civil War at Shiloh. But the reason we are discussing him tonight is because of an announcement, made on 24 January 1894, when the Roscommon man was awarded the Congressional Medal of Honor for his efforts in 1861. The date of his rescue mission at Apache Pass meant that Bernard Irwin’s award is the first– by date of action­– of all Medals of Honor. Irwin also became the progenitor of a line that would see continued distinguished military service into the 20th century. More than 50 years after he had rescued Lieutenant Bascom in Arizona, his son George LeRoy Irwin would fight as a General on fields such as the Marne, the Aisne and the Meuse-Argonne during World War One. 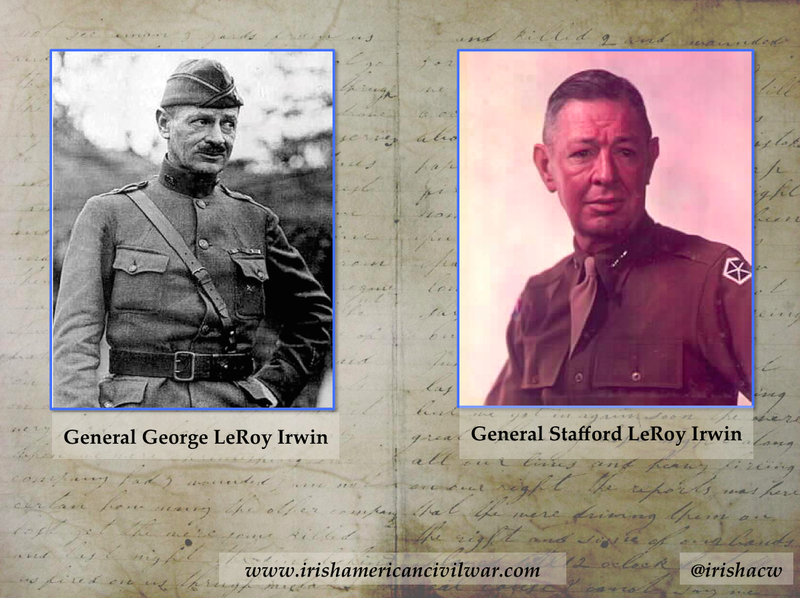 More than 80 years after his march against Cochise, Bernard’s grandson, Stafford LeRoy Irwin, also a General, would lead a division against the Germans in the Kasserine Pass and go on to command the XII Corps in Patton’s Third Army. 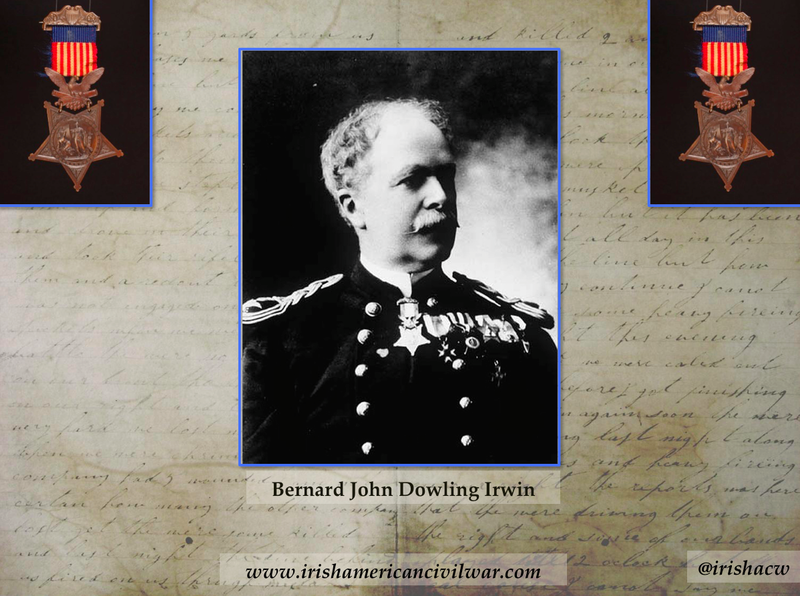 In many ways the Irwin family’s military story mirrors the interaction that the Irish had, and continue to have, with both the United States armed forces and the Medal of Honor. But what of the history of the award itself? The Medal of Honor was instituted on 21 December, 1861, to recognize gallantry and intrepidity at the risk of life and above and beyond the call of duty. It began its history as a naval award, and was initially restricted to enlisted personnel in the United States Navy and Marines. An army Medal of Honor followed on 12 July, 1862, and was likewise restricted to enlisted personnel. The latter award was expanded to include army officers on 3 March, 1863, although naval officers would have to wait until 1915 to become eligible. The first Medals of Honor issued were to six survivors of “Andrews’ Raid”, an all volunteer mission which was targeted at disrupting rail communications in Confederate held Georgia. These were presented in Washington on March 25, 1863, with the first naval presentations taking place a few days later, on April 3. It was at the latter ceremony that the first Irishmen received the Medal, with nine of the 41 recipients having been born in Ireland. To date, a total of 3,512 Medals of Honor have been issued. Officially, 258 of these awards have been to men of Irish birth, with many hundreds more to those of Irish ancestry. However, we now know that the figure of 258 Irish-born recipients is inaccurate. 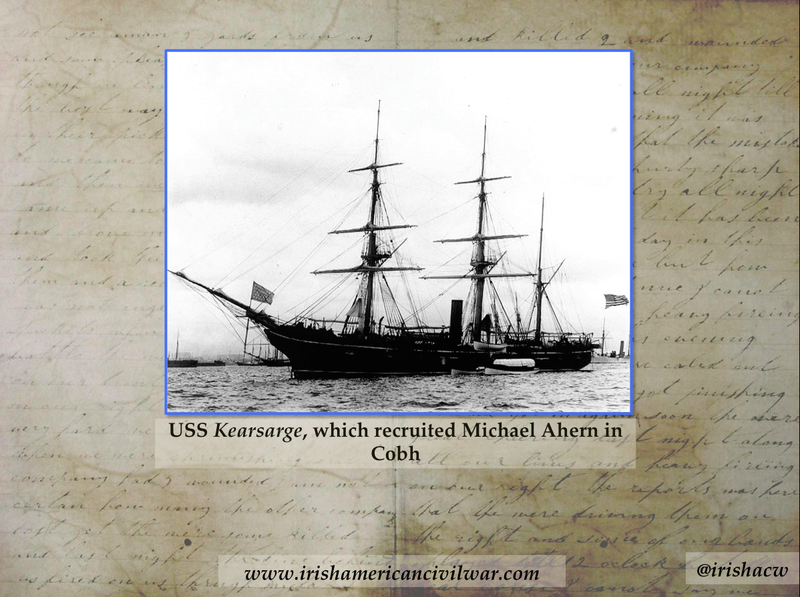 Ongoing research is adding more names to this list; William Marvel’s work has demonstrated that the ‘Michael Aheam’ listed as being from France, and awarded the Medal of Honor for his actions in helping to sink the CSS Alabama off Cherbourg in 1864, is actually ‘Michael Ahern’, who was illegally recruited by the USS Kearsarge in Queenstown, now Cobh, Co. Cork in 1863. The United States Medal of Honor Historical Society together with the local history society in Danville, Illinois, have shown that Martin McHugh, a Medal of Honor recipient who earned his award for helping to save crewmates after his vessel was sunk by Confederate fire at Vicksburg, Mississippi in 1863, was not from Ohio as previously thought, but was in fact a Galwegian. Similarly, my own work suggests that Thomas Horan, who received the Medal for his capture of the flag of the 8th Florida Infantry at Gettysburg in 1863, was born in Ireland; whereas his current official place of birth is recorded as unknown. There are indications that there are yet more recipients who await such identification as Irish. Somewhat surprisingly, there has never been a major systematic study of Irish recipients of the award. We know very little about many of these men, especially those from the nineteenth century. We do not, for example, know the county of birth for most of the Irish recipients. 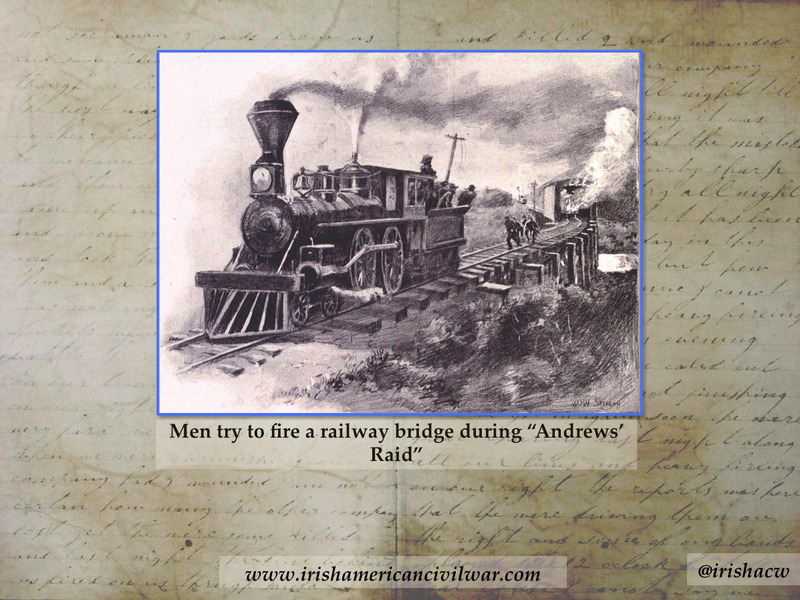 Of that Irish contingent, the majority earned their awards during the American Civil War. I have identified at least 148 Irish-born recipients for Civil War actions between 1861 and 1865, almost 10% of all medals awarded during this period. This is unsurprising given that some 200,000 Irishmen served during the conflict, 180,000 of them with the Union. Similarly, the fact that an estimated 1 in 5 of the Union navy– more than 23,500 men– were of Irish birth is reflected in the fact that just over 15% of Naval and Marine awards from the conflict were to Irishborn men. What though of the men behind the awards? I have examined a number of these men’s lives in an effort to find out their stories, and hope to share some of them with you this evening. The first is that of Menomen O’Donnell, who grew to adulthood in the townland of Drumboarty to the north of Donegal town. He arrived in America at the age of 18 in 1848, at the height of the Famine. 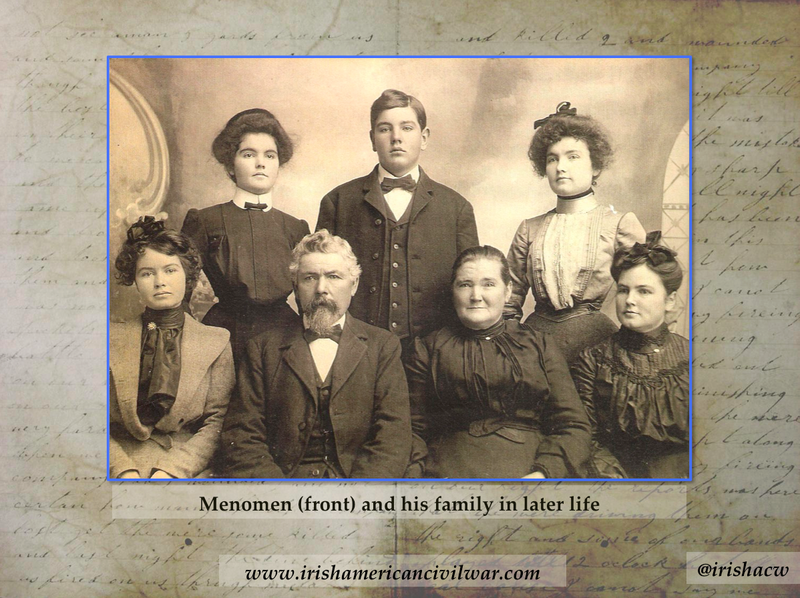 Like many of his fellow Ulstermen, Menomen made his home first in Pennsylvania, where he married Mary Bailey in 1850– they would go on to have nine children together. Menomen was soon making a huge success of life across the Atlantic. Moving to Bridgeport, Illinois, he went into farming and stock-breeding, at one point owning over 1,000 acres. The money he made from this allowed for the chain migration of the rest of his family, as he paid for his brothers, sisters, father and step-mother to join him in Illinois from Ireland. Indeed such was his success that he even managed to visit home– for Menomen O’Donnell, America was fulfilling all his hopes and dreams. A second action in Fort DeRussey, Louisiana, the following year was the other reason for his award. There, Menomen voluntarily joined an assaulting column, and as the only mounted man, took an extraordinary risk as he rode with them into the Confederate works. Menomen’s list of war injuries are testament to his extraordinary bravery. Wounded twice at Fort DeRussey, he was shot three times in the arm during a skirmish at Grand Ecore, Louisiana, and had two horses shot from under him at Tupelo, Mississippi. Somehow he survived to return home, being mustered out at St. Louis in late 1864. Menomen O’Donnell would receive his Medal of Honor in 1897. By the time the award was made, Menomen had again had an opportunity to demonstrate his extraordinary resilience in the face of difficulties. The financial crisis known as the Panic of 1873 destroyed his fortune, which was estimated at some $70,000. Having built himself up and survived the hardships of war, Menomen now faced perhaps his toughest challenge. He moved his family once more, to Vincennes, Indiana in 1879, and started again. Opening a butcher’s shop, he slowly built up his family’s circumstances once more, and became active in local veteran groups and with the Democratic party. Having successfully conquered his post-war setbacks, Menomen was able to enjoy his later years. He passed away in his home at the age of 81 on 4 September 1911; his life having served to illustrate just what America was able to offer some of the more fortunate of Ireland’s emigrants. 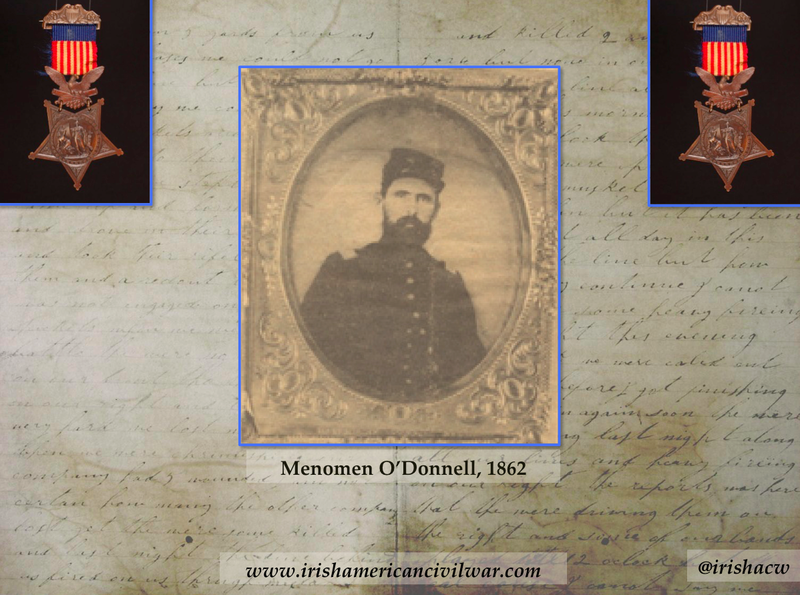 Menomen O’Donnell was indeed fortunate to survive the brave actions which had led to the award of his Medal of Honor. Other Irish families were not so fortunate. 25-year-old Wicklow man William Jones had enlisted in the 73rd New York Infantry in 1861, often called the 2nd Fire Zouaves due to the large number of New York firemen in its ranks. It formed part of the famed Excelsior Brigade. As with Menomen, William seems to have been a natural soldier. He rose to the rank of First Sergeant in his regiment, and when his term of service expired he re-enlisted as a Veteran Volunteer. Back in New York, William’s young family must have spent much of the war worrying about his fate. He had married his Irish sweetheart Margaret Carney in New York’s St. James Catholic Church on 9 November 1857, and their first child, Susan, had been only a few months old when William marched off to war. By the time William signed his re-enlistment papers, his wife was heavily pregnant with their second child, William Junior, who was born on 17 April 1864. That May would witness the commencement of the Overland Campaign, the unparalleled whirlwind of death that came as Ulysses S. Grant’s Union forces relentlessly pursued the destruction of Robert E. Lee’s Army of Northern Virginia. 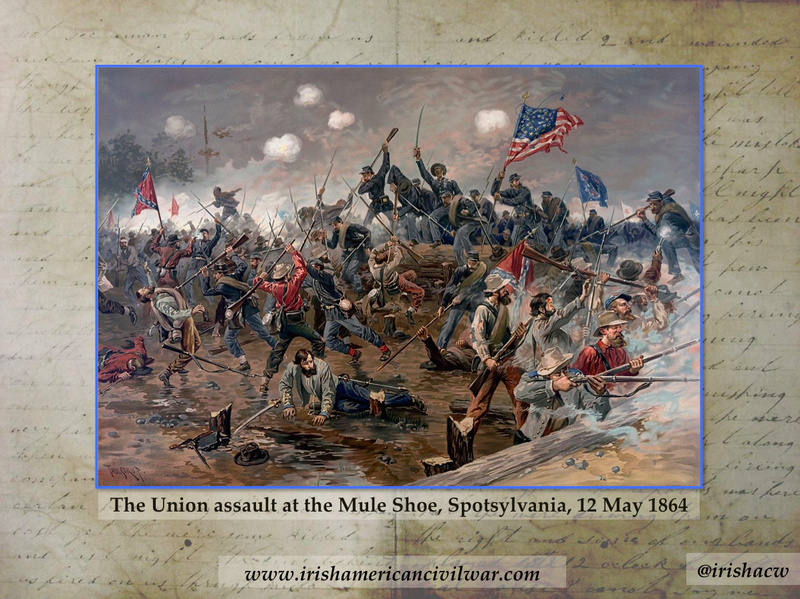 Nowhere was that inferno greater than around the battlefield of Spotsylvania Courthouse, and nowhere at Spotsylvania could match the horrors of the close-quarter combat that erupted for hours at the position known as the Mule Shoe Salient on 12th May. William Jones was one of those caught in this maelstrom. True to his previous actions, he did not shirk from the fight. Throwing himself forward, he successfully captured the colors of a Rebel regiment, the act for which he earned the Medal of Honor. Unfortunately William would not live to receive it, as he did not survive the day’s horrors. When the Medal of Honor award was made in December 1864, it was done so posthumously. Although the award must have been a source of great pride to William’s widow Margaret, her immediate concerns must have lain with the future of her family. Tragically, the couple’s son William Junior was not even a month old when his father died at Spotsylvania. Their daughter Susan had not yet turned four. Unfortunately, as often appears to have been the case with Civil War widows, William Junior soon followed his father to the grave, dying sometime between 1864 and 1866. Margaret Jones never remarried and as the decades passed she and her daughter remained living together, their fortunes tied both emotionally and economically. In 1880 Susan, then 19, was working as a bookfolder to help support them both. They were still making their life together in the early 20th century when they lived on Butler Street in Brooklyn. It was here in 1908 that Margaret became gravely ill. Susan gave up fulltime employment to nurse her mother with assistance from Sister Radegonde of the Order of the Infant Jesus, but despite their efforts Margaret Jones passed away that October. As the 20th century progressed, Susan continued to live alone, now the last of the Jones family. 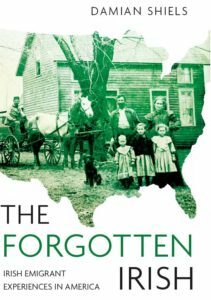 Her life had been inexorably altered by the events in Virginia all those years ago, when the death of her father had cast a shadow over the remainder of the family’s lives. Susan used the last of her mother’s pension money to erect a granite headstone over Margaret’s grave in Holy Cross Cemetery, Brooklyn, testament to her devotion to her mother. For the O’Donnells and the Jones’s, the post-war years saw them struggle to overcome the economic and emotional consequences of war. For other Irish Medal of Honor recipients there was another challenge to face– that of disability. 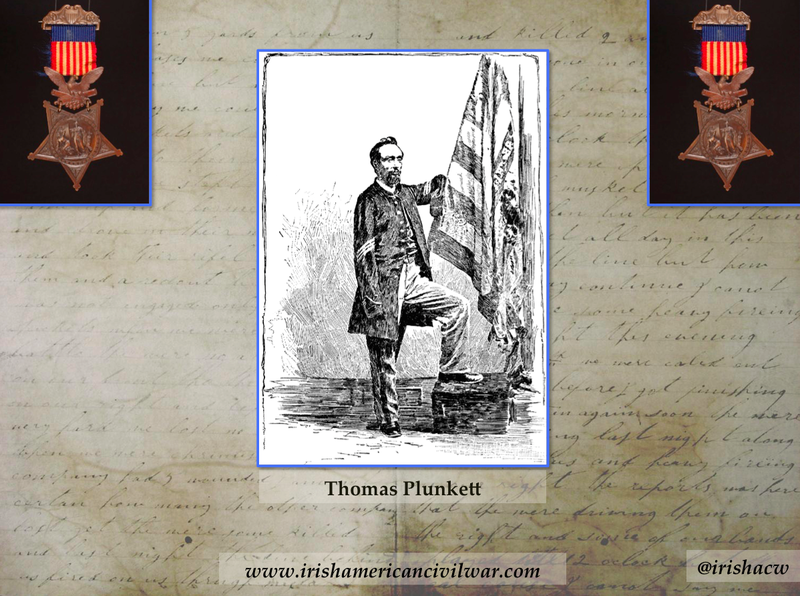 One of them was Thomas Plunkett, who had emigrated to West Boylston, Massachusetts from Co. Mayo. Thomas was 21-years-old when he enlisted in what became Company E of the 21st Massachusetts Infantry on 23rd August 1861. Just over a year later, and now a Sergeant, he watched from Fredericksburg as soldiers of the Union Army of the Potomac’s Second Corps, including Thomas Francis Meagher’s Irish Brigade, dashed themselves against the almost impregnable Confederate positions along Marye’s Heights on 13th December 1862. As the day drew on and the killing continued, it eventually became the turn of the Massachusetts men to try and breach the Rebel position at the stone wall. Even as the 21st dressed their lines for the attack, shells began to rain down. A member of Company I was decapitated before they had even begun their advance. As they surged forward, canister and small arms were added to this long-range artillery fire. On Civil War battlefields, it was usually the men holding the regimental colors who attracted the most attention. Color Corporal Barr carrying the state colors and Color Sergeant Collins carrying the national color both fell, mortally wounded. Thomas Plunkett, who was advancing behind the line as a file closer, didn’t hesitate. Throwing away his gun, he stepped forward to pick up the Stars and Stripes from Collins, moving to the front of the advancing men as they closed towards the sheet of flame that marked the Confederate position. Now a valued target himself, the Mayo man had a near miss when a bullet pierced his cap. Though fortunate on this occasion, Thomas’s luck would soon run out. A shell arced into the ground in front of the Sergeant, killing three of his comrades. A shrapnel fragment almost tore away his right arm at the shoulder, leaving it hanging by a strip of flesh. It then spiraled on into his chest, but failed to penetrate, thanks to the presence of a book that Thomas had picked up in Fredericksburg earlier that day. That book saved his life, but the deflected shrapnel carried on to smash into his left wrist, creating another terrible wound. Incredibly, Plunkett did not go down. Despite the injury to both his arms, he somehow managed to keep the colors aloft, crying to his comrades “Don’t let it fall boys, don’t let it fall!.” He remained there, even as the flag became soaked in his blood, until another soldier stepped forward to relieve him of his charge. Carried back to a stretcher in Fredericksburg, unfortunately, neither of Thomas’s arms could be saved. Later that day he endured a double amputation. Not expected to survive, he was fortunate that a very special nurse, Clara Barton, was at hand. Perhaps the most famous female nurse to emerge from the conflict, Clara would later go on to found the American Red Cross. 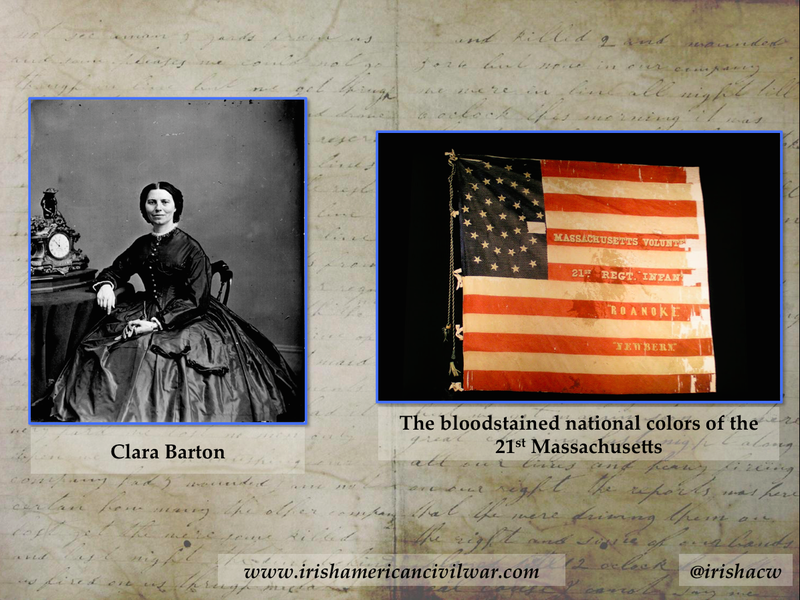 She stayed with Thomas as the surgeons did their work, and when she was later shown the flag he had carried, remarked that his blood had “literally obliterated the stripes.” Clara would again return to Thomas’s aid in 1863, when the Mayo man had recovered sufficiently to be taken home to Massachusetts by his brother. Military authorities were taking a long time to authorize permission for Thomas’s departure, and so Clara took the wounded soldier to see Massachusetts Senator (and later Vice-President) Henry Wilson on the Capitol. After she introduced them, Senator Wilson extended his hand to Thomas, saying ‘How do you do Sergeant?’ Clara quickly interceded, gently telling the Senator: ‘You will pardon the Sergeant for not offering you a hand, he has none.’ The shocked Wilson exclaimed ‘No hands!, No hands! My God, where are they?’. When Clara Barton explained what had happened, the Senator speedily resolved the difficulties, and Thomas was able to go home. The 19th century was a tough time to be left in a such a disabled condition, but Thomas Plunkett made the most of his remaining years. He received his Medal of Honor in 1866, but his actions had already become famous, with charitable donors raising thousands of dollars for his welfare. He went on to marry and have two children, and in later life spent 15 years as a messenger in the State House at Boston. He was determined not to let his disability hold him back. One person noted that there ‘were many things he could do that seemed inexplicable to those around him. For instance, he could drive the fiercest of horses, and often enjoyed an airing upon the road. With the reins over his shoulder, he was able to guide and control the animal in a manner that would do credit to the most expert horseman.’ Thomas Plunkett’s fulfilling post-war life was brought to a close on 10 March 1885, when he died as a result of illness at the age of 44. He was buried in Hope Cemetery, Worcester. Thomas’s fame had endured; sketches of his body lying in state were produced for publication, and his continuing popularity was exemplified on 22 November 1895 when a huge crowd attended the unveiling of a portrait of Thomas by J. Madison Stone at Mechanic’s Hall, Boston. The Massachusetts State House now houses the national color of the 21st Massachusetts that Thomas carried at Fredericksburg, which even today remains covered in the Irishman’s blood. 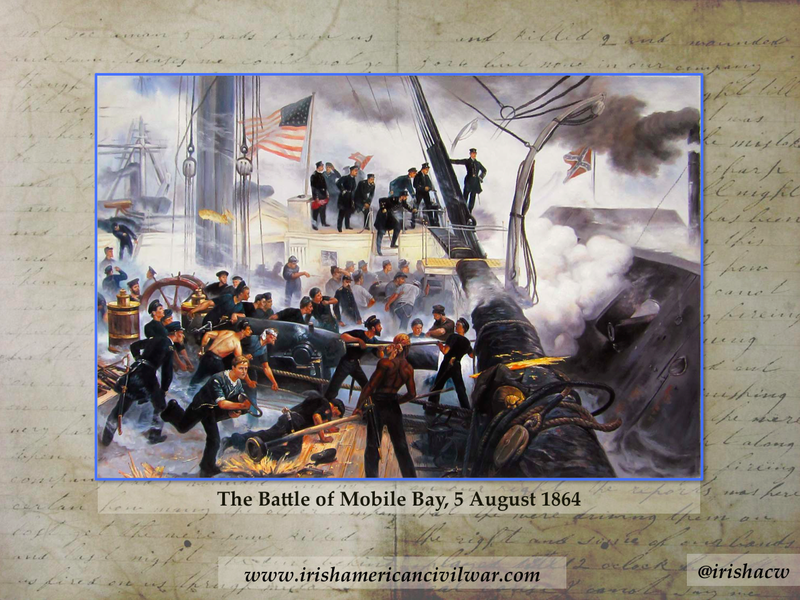 To find the largest number of Medals of Honor awarded to Irishborn men for a single action, we must look to the waters of Mobile Bay, Alabama, on 5 August 1864. That day a fleet of eighteen Union ships under Rear Admiral David G. Farragut entered the Bay with the aim of putting the port out of action as a centre for blockade running. The fleet passed under ferocious fire from forts and through a minefield– giving to history the quote ‘Damn the torpedoes, full speed ahead!’ – and on into the harbor to engage Confederate vessels. The heavy fighting ultimately led to the closing of the port, and was an important boost for Abraham Lincoln during the 1864 Presidential campaign. A total of 14 Irishmen earned the Medal of Honor that day. One of them was Coxswain John Cooper of the USS Brooklyn. Born in Dublin in 1832, he would soon become part of a rare group of Irish Medal of Honor recipients– those that earned the award on two occasions. and John King from near Ballinrobe in Co. Mayo, who received his Medals of Honor for heroism in the performance of his U.S. naval duties during two separate on-board boiler accidents in 1901 and 1909. As the actions of some of these double-recipients indicate, Irishborn men continued to be awarded the Medal of Honor in large numbers after the Civil War. Some medals were awarded for noncombat gallantry, while many were also earned during the Indian Wars. In 1871 four Irishmen were among the 15 Medal of Honor recipients that resulted from fighting in Korea, forming part of what became known as the Korean Expedition– the first Medals of Honor ever awarded for actions on foreign soil. As the 19th century drew to a close and the 20th century beckoned, Irishmen would be awarded Medals of Honor for actions during many far-flung conflicts from Cuba, to China to the Philippines. One sailor who earned the Medal of Honor during the fighting around Cuba in the Spanish-American War is worthy of particular mention. On 11 May 1898, 37-year-old Michael Gibbons from Kilmeena, near Wesport in Co. Mayo was serving as an Oiler aboard the USS Nashville off the Spanish held-position of Cienfuegos. That day, along with 51 other sailors and marines, he set off to cut the undersea cables that were enabling the Spaniards to communicate with their forces elsewhere. In order to carry out the operation the men had to row close to shore in small boats, raise the cables from the seabed, and cut through them using the tools they had to hand, all the while enduring a heavy fire. Michael and the other participants earned the Medal for their extraordinary bravery and coolness throughout the action. What is particularly interesting about Michael’s story is that after his discharge from the navy he ultimately returned home to Ireland. He died in his native Mayo in 1933, where he was buried in Old Kilmeena Cemetery. For decades his grave remained unmarked, until the efforts of Ron Howko and the American Legion finally rectified that oversight in 1999. Beyond those men born in Ireland, there were also many hundreds of individuals of Irish descent who were awarded the Medal of Honor in the 19th century. Putting a definitive number on them is difficult, but in many cases they would almost certainly have identified themselves nearly as closely with this island as they did with the United States. Given that one of tonight’s guests of honor is Minister Charlie Flanagan TD, who hails from Co. Laois, it is interesting to note that one such Irish-American was another Flanagan– James– who also had Laois origins. James’s father and namesake had been born in Laois around 1800, before emigrating to Montreal, Canada where he married Dubliner Catherine Fury. They then moved on to St. Lawrence County, New York. James Jr. had been born in Montreal in 1826, and worked with his father on their New York farm before heading west to make a living in the lumber business. When war came he enlisted there in the 2nd Minnesota Infantry, with whom he would serve the entire war. He earned his Medal of Honor at Nolensville, Tennessee on 15 February 1863, when he and 15 other men held off a far superior Confederate cavalry force attempting to take a wagon train, in what was described as a ‘heroic defence.’ After the war, this son of Laois returned to the 80-acre family farm in New York, married a woman called Kate Mallen, and had four children. The 20th century largely saw the passing of the Medal of Honor baton from Irish-born recipients to those of Irish-American descent. This is not to say that that there were no Irish-born recipients in the conflicts to come. 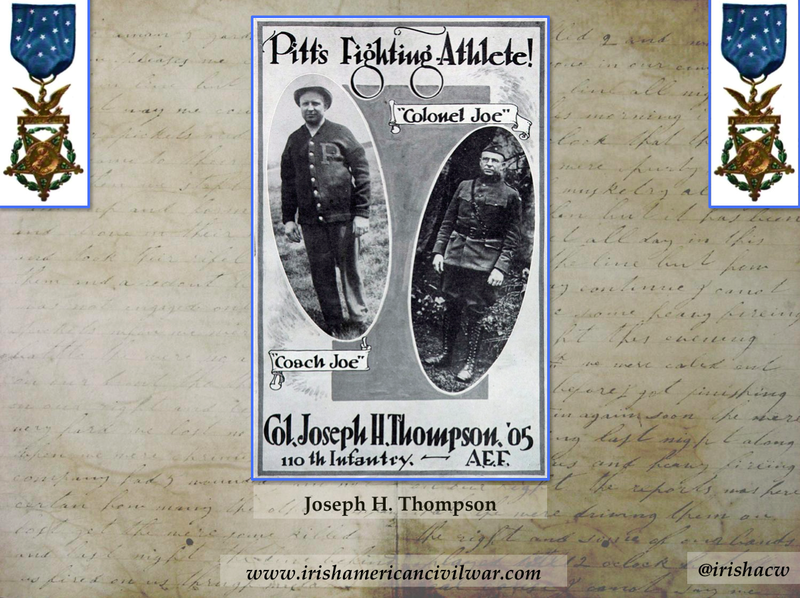 One of the most notable was Joseph H. Thompson, called ‘The Fighting Irishman’ by the New York Times, who was from Kilkeel, in Co. Down. He emigrated to the United States in 1898 at the age of 18 and embarked on a remarkable sporting, military and political career. He both captained and coached the University of Pittsburgh football team and has been inducted into the College Football Hall of Fame. A lawyer by profession, he became active in local politics with the Republican party, becoming a State senator between 1913 and 1916. During World War One, Joseph served as a major with the 110th Infantry of the 28th Division. On the 1 October 1918, near Apremont, France, he ignored small arms and artillery fire as he sought to encourage his men, later rushing forward under fire three times to help guide a tank towards an enemy machinegun nest. 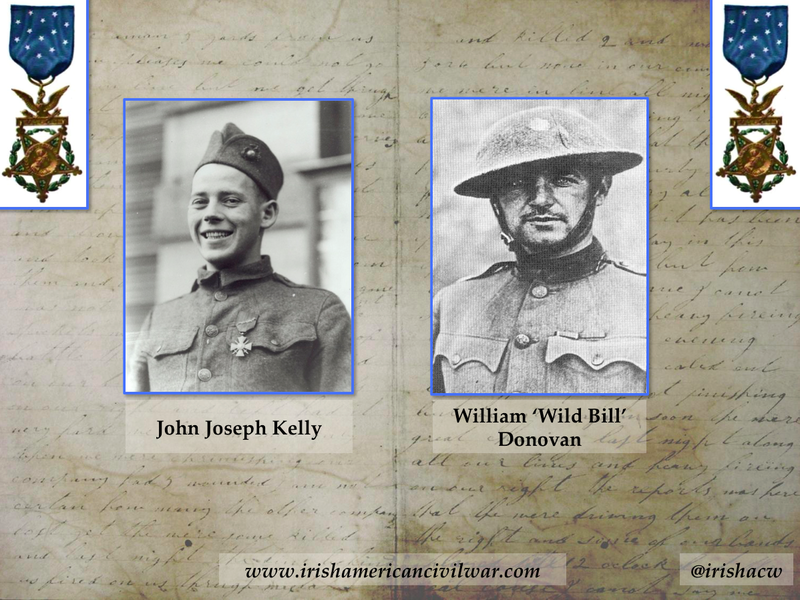 World War One saw a number of significant Irish-American recipients of the award. One was Chicago native John Joseph Kelly, who was another two-time recipient of the Medal of Honor; he received both the army and navy awards for actions at Mount Blanc Ridge in France on 3 October 1918 while serving with the 78th Company, 6th Regiment of the U.S. Marine Corps. Another was William Joseph ‘Wild Bill’ Donovan. Born in Buffalo in 1883, Donovan, always proud of his Irish origins, went to the Western Front as a Major in the famed 69th New York. Wild Bill earned the medal when as a Lieutenant Colonel he personally led an assaulting column near Landres-et-St. Georges on 14-15 October 1918. Even when wounded by machine gun bullets he refused to be evacuated until his unit could be withdrawn. William Donovan is the only American to have received all four of the United States highest decorations; during World War Two he became the founder and first head of the Office of Strategic Services– the OSS– the forerunner of the Central Intelligence Agency. He rose to the rank of Major-General during that conflict and later served on the prosecution team at the Nuremburg Trials. 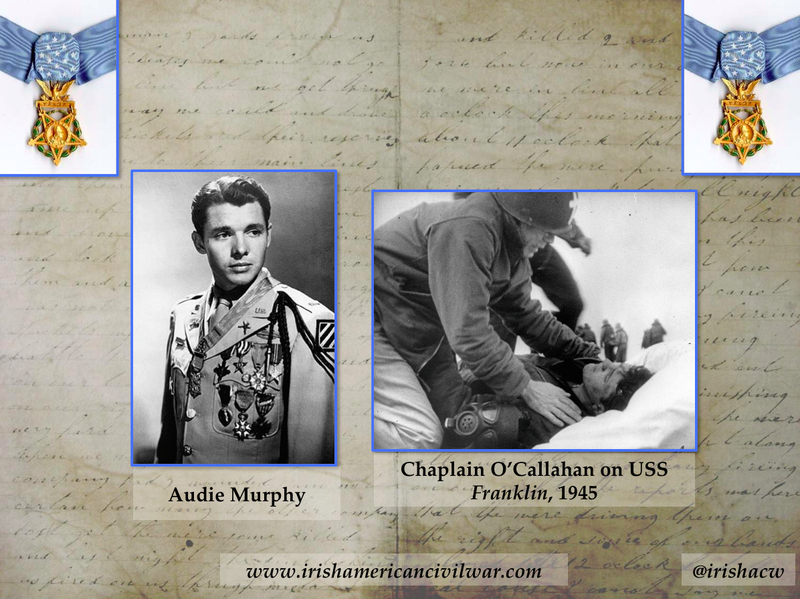 The strong Irish-American association with the Medal of Honor continued through World War Two. One of the most famed from that conflict is Audie Murphy, the Texan rejected by the marines for being too small, who enlisted in the army and became one of the most decorated soldiers of World War Two, and later a famous actor. He earned his award for an incredible solo defence of his unit’s position in north-eastern France in January 1945, in which he killed or wounded as many as 50 attacking Germans. Another is Chaplain Joseph T. O’Callahan, a Jesuit priest from Roxbury, Massachusetts, who taught at Boston College, Weston College and the College of the Holy Cross. He earned his award aboard the aircraft carrier USS Franklin off Japan on 19 March 1945. That morning the Franklin was struck by two Japanese aerial bombs, which ignited fuel and aircraft on the deck and rocked the vessel with devastating secondary explosions and fires, killing hundreds of men and wounding many more. Father O’Callahan was an inspiration to those around him, ignoring the inferno as he moved about the vessel ministering to the wounded and dying, and playing a leading role in efforts to control the blaze. Irish-American connections with the Medal of Honor have continued through the Korean and Vietnam Wars. 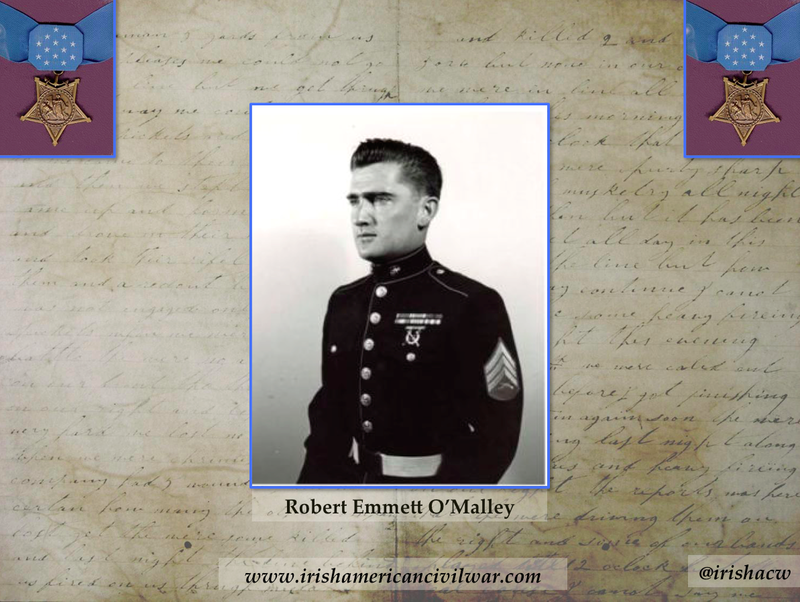 One does not have to look far for the Irish-American in men like New York native and U.S. Marine Robert Emmet O’Malley – hint, the clue is in the name. In South Vietnam on 18 August 1965, with his squad pinned down by Viet Cong fire, O’Malley raced across an open rice paddy towards the enemy, jumped into their trench, and single-handedly took the position. He then brought his men to the assistance of another heavily-engaged unit and helped them extricate themselves, before in turn assisting in their evacuation and in that of his own squad. Wounded three times, Sergeant O’Malley refused to leave the combat zone until all his squad had been boarded on helicopters. I want to end this brief look at Irish and Irish-American Medal of Honor recipients with a final example, and one that demonstrates the continuing links between men and women of Irish descent and service in the United States military. On 18 April last in Kinsale, Co. Cork, I was honoured to be present for the dedication of the first chapter of the Irish Veterans organization. 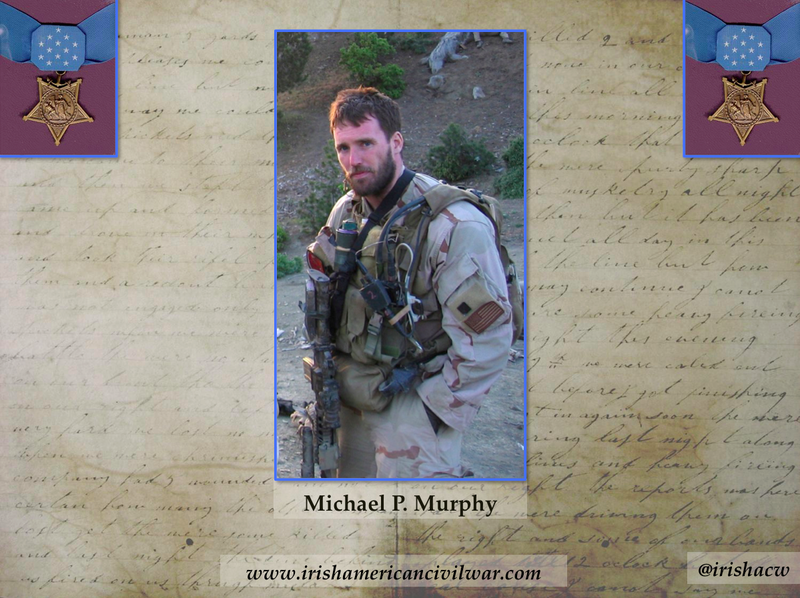 The group, which aims to conduct historical research into Irish people involved in foreign conflict, had named the chapter in honour of US Navy Seal Lieutenant Michael P. Murphy. Among the attendees at the ceremony were Ambassador O’Malley, and Lieutenant Murphy’s parents, brother and family members. On each of his missions, Michael Murphy carried the patch of New York City Fire Department Engine Company 53/Ladder Company 43, partly in recognition of the FDNY’s heroism on 11 September 2001, 14 years ago today. The 29-year-old New Yorker was killed in action in Kunar Province, Afghanistan in June 2005 along with 18 of his comrades during an operation against the Taliban. During that engagement, Lieutenant Murphy, commanding a four man SEAL team, showed exceptional courage as he attempted to extract his men against overwhelming enemy numbers. Ultimately he gave his life in an act of extraordinary self-sacrifice, as he knowingly exposed himself to enemy fire in order to transmit a call to bring aid for his men. Lieutenant Michael Murphy is the latest of 22 men bearing that surname who have earned the Medal of Honor. Murphys have done so on the battlefields of Virginia in the 1860s, on America’s western plains in the 1870s, off the coast of Cuba in the 1890s, outside Peking, China in the 1900s, on the Siegfried Line, Germany in the 1940s, in Korea during the 1950s, and in the Kunar Province of Afghanistan in the 2000s. 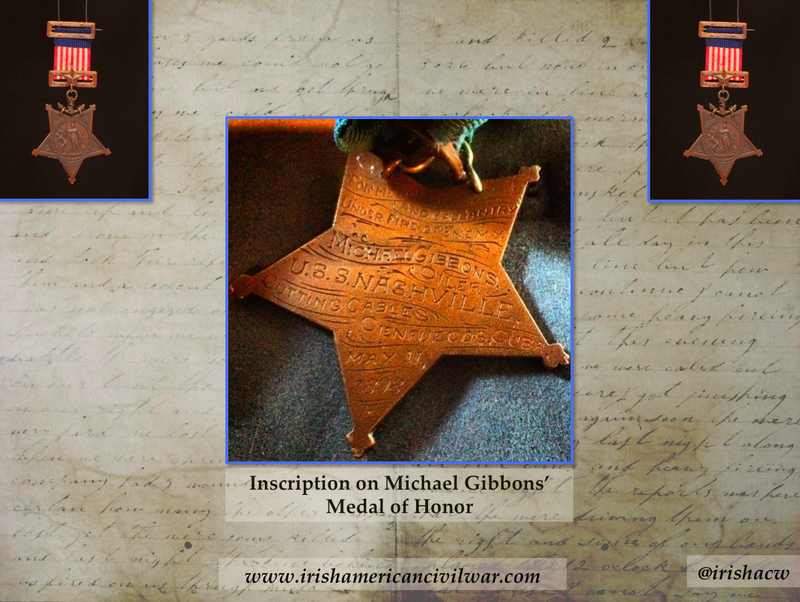 Through the lens of just one surname, we witness in microcosm the story of Irish-American connections with not only the Medal of Honor, but also the Irish tradition of military service in the United States of America. It is a legacy that appears set to continue. The honored guests were indeed fortunate to attend another extraordinary presentation by “historical” rock star, Damian Sheils! Thanks for introducing all of us to these Irish heroes — may their sacrifices be forever remembered. I believe that your work encourages each of us you touch with your words to seek out the stories of our past as inspiration for our future. Thanks Jackie I appreciate that, don’t know about rock star though 🙂 I couldn’t put together work like this without all the work of everyone in NARA and elsewhere who strive to make this material available to the wider world! Thanks Aidan! The Cavan event was great- I am looking forward to hearing your Civil War Women talk in full in the not too distant future as well!